Before 2015, faculty at the University of Arizona who wanted to teach online didn't have much in the way of formal support for building their online courses. Instructors got approval from their department heads to do an online course, and they may have opted into help from the Office of Instruction & Assessment (OIA), but there were no established processes or requirements. For some faculty, that was the end of the onboarding experience. "That's all you got," said Angela Gunder, associate director of the Office of Digital Learning (ODL). "You [were] now an online instructor." With the launch of UA Online, the university's virtual campus offering fully online degree programs, ODL was created with the goal of "doing things a little bit differently," said Gunder. Instructional designers assumed that meant a more structured approach with "benchmarks" and "steps," but Melody Buckner, director of ODL, had a different idea: focusing on faculty. Buckner decreed, "[Instructional designers are] going to listen to faculty about how they teach, how their students prefer to learn and the unique challenges they face in the classroom," as Gunder recalled. "The faculty are going to drive the process, with the instructional designer there to support and facilitate production." At the same time, Buckner assured ODL team members that they'd gain access to the resources (both people and tools) they'd need to help faculty prepare for an onslaught of new online teaching opportunities, while also setting expectations high. Since then, ODL has grown from zero courses to almost 400 and from eight people to 23 in the first two-and-a-half years of its existence. The group includes not just instructional designers and administrators, but also videographers, technical support staff and experts in graphic design, website development, quality assurance and project management. Gunder and several members of the ODL shared their story at this year's OLC Innovate conference, during a session they titled, "Ready for Takeoff? Don't Forget Your Toolkit — Successful Onboarding of Instructional Designers and Faculty." How to help "legacy instructors" — those who have been teaching online for "years" — improve their instructional practices. To address that span of needs, ODL came up with an asynchronous toolkit that people could go into and take what they needed for their own onboarding experiences. 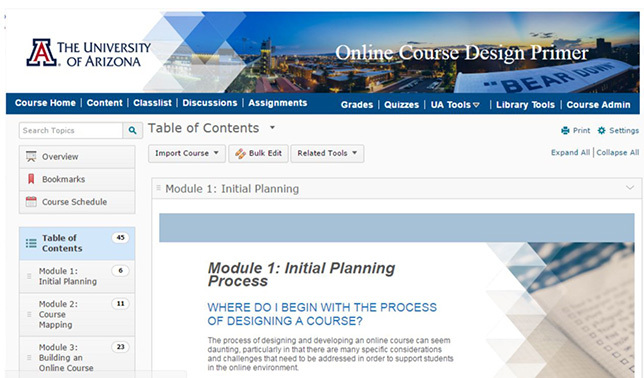 Thus was born the "Online Course Design Primer," built within the university's learning management system, D2L's Brightspace. The first module was particularly important (and personal) to Senior Instructional Designer Matt Romanoski. When he joined the team, he replaced a colleague who had taken another position while leaving several courses incomplete. When that person left, handing over "a list of six people that I've got to develop a course with," Romanoski wondered what to do. That experience convinced him that changes were needed in the onboarding processes for staff and faculty. "When we bring other instructional designers and new faculty on, we want to be sure that no one's lost. That means engaging everyone in a clear design process that shows how we get from A to Z." From the very beginning of the planning process, which takes about 30 minutes to work through, the designer now goes over what an effective online course looks like, how it's developed, how it differs from a face-to-face or hybrid course and what the timeline is expected to be. For experienced online instructors, this process can be shortened or even bypassed, said Romanoski. The second module, covering course mapping, is different. That content is often new to almost all faculty. The course map "works as a blueprint for the construction of the course," Romanoski explained. When the instructional designer and an instructor set out to work on the map, it's placed on Google Docs for collaboration. Each topic within the course is laid out in terms of learning objectives, learning content and resources/activities. The learner — whether a new employee or a faculty member — can view a course map already populated and watch a video about how to fill it out. The third module, which covers how to construct an online course, is where those experienced faculty members who seem to know it all can be wooed into reconsidering their online course practices. The team's graphic designer has come up with a passel of designs for courses that faculty can work from. "We knew we wanted to build something that didn't look like your standard learning management system," said Gunder. "We spent quite a lot of time figuring out how to make something that was engaging and beautiful, that wouldn't break and that would be supportive of faculty going in and entering their text directly into these spaces." Romanoski added that faculty members' response was: "I did not know we could do this with D2L. I want my course to look like that." But visual design is only one aspect of course construction — the "Building a Course" module comprises five areas of coverage, making it the longest section of the Primer. Instructors can tour lecture best practices, such as the use of VoiceThread for sharing content, producing videos and facilitating visual discussion boards. They can also bolster their skills in creating lessons that will engage learners, using tools in D2L to create assignments, implementing inquiry- and project-based models and learning how to set up assessments that align with learning objectives. UA Online's Office of Digital Learning recently launched a new Google Site where it shares guidance on how to build a primer for helping faculty and staff create online courses. While at least one of the resources requires Google permission to view, others are openly available, including the primer framework, samples of course design worksheets, course map templates and a course design inventory checklist for doing continuous improvement. One dedicated sub-module covers the topic of "instructor presence" to show instructors how to introduce themselves to students, use videos and set up virtual meetings to add a sense of presence. Overall, the goal is to "model the possibilities and encourage people to use them," said Senior Instructional Designer Josie Strahle. The course modules are optional. No instructor is required to go through them before teaching online. However, there are a few required aspects that nobody involved with ODL can bypass. Every module or unit included in the course map must have learning objectives spelled out. Learning objectives are at the core of the online module. Faculty usually have these embedded in their content, but may not make them as transparent as they need to be for an online course, noted Romanoski. "We have to remind them in an online course they don't necessarily have two to three interactions when they can remind the students what the objectives for that week are." Creating and revising learning objectives can be a "rocky" process, he added. "But as we move through future iterations, we're able to refine those [and] make them more meaningful." Also, every course is required to include a "Start Here" menu that adheres to Quality Matters online quality assurance rubrics, of which the university is a proponent. That's where components such as accessibility, copyright and navigation functionality live. "We want the students coming into the course already knowing how to navigate it no matter what UA Online course they're in, so they can get right into focusing on content," said Romanoski. As a side benefit, consistency reduces the amount of e-mail instructors get early in the course from students asking for help in finding what they need. As a Quality Matters institution, UA has trained its instructional designers in the use of QM's rubrics and maintains a "pretty robust internal review process," said Janet Smith, the quality assurance coordinator for UA Online. Every semester, about a quarter of courses in the program are undergoing reviews. Each course also gets a "design inventory" every semester, she noted, to document "absolutely mission-critical standards that we want to make sure courses are meeting from the very beginning." Those become internal documents given back to instructional designers for future attention. However, that pace is hardly sustainable. There, the focus may shift to assess only those courses that are redesigns, since they tend to need more adjustment. "It's easier to ensure the quality of a course when it is built new than when we're trying to retrofit it," she explained. Since reviews aren't the most popular activity for faculty to participate in, Smith tries to make them as lightweight as possible. "We know the first time [a course] goes through a QM review, it's going to have a lot of issues. We expect that," Smith said. To counterbalance the burden, she encourages faculty to "choose one or two things they can work on improving." The next time the course is reviewed, the attention can be redirected to something else. Given sufficient exposure to the Primer, reluctant faculty find at least "one thing they can get excited about," said Strahle. "It's not instant. It's not complete," she emphasized, but it is a start. She also points instructors to use cases. "Faculty respond to evidence," she said. "Showing them where it's worked has been really successful." Romanoski prefers to "kill them with kindness." As he explained, "I praise what they do a lot." Then he dives into the sales pitch: "There are these new tools that the university has created ...."
"It's often a massaging process," he added. "I have seen other instructional designers try to use the hammer to come down on faculty. It doesn't work. Collaboration is key — you've got to let the faculty know that all the work they've done over the last 10, 15, 20 years is solid, because it is!" Share what you develop. The Office of Digital Learning team is charged with helping only those faculty members who deliver courses within UA Online. However, they'll also grant access to the online resources to all University of Arizona instructors outside of the program. Use on-demand. UA Online doesn't follow a set start and end date for online course development; faculty dip into the Primer whenever they want. However, ODL does propose a timeline when a specific course is under construction: "To launch in January 2018, here's where you should be in fall 2017." 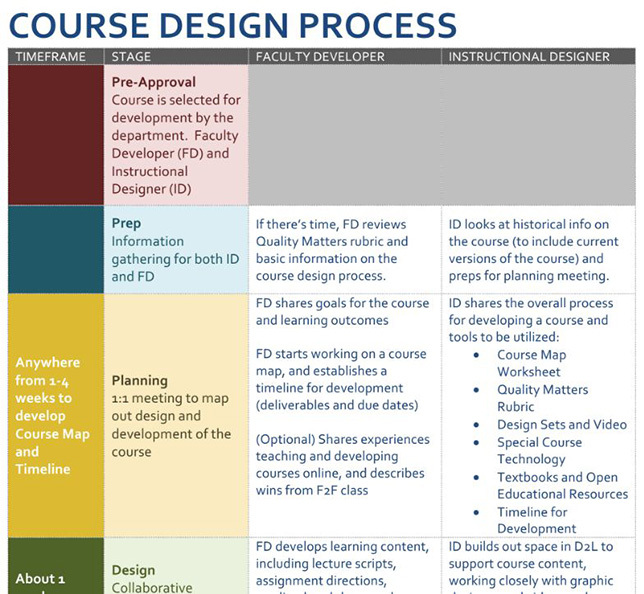 At any given time, the instructional designers estimate, they're working with about 20 faculty members, each at a different point in the course design or redesign process. Partnerships are paramount. The university has an Office of Instruction & Assessment, which handles teaching online in any form. UA Online works "closely" with that group, according to ODL Associate Director Angela Gunder. While ODL handles course design, OIA tackles pedagogy and facilitation. That office teaches a course called "Introduction to Teaching Online," which ODL promotes to faculty. ODL also pushes Online Learning Consortium courses on how to teach online. As an institutional member of the consortium, Gunder said, "We have found a lot of joy in sending folks there for more instruction. The folks who have done that have been quite successful." There's no reason to stick with a single set of quality rubrics. Although UA Online uses the Quality Matters rubrics for designing excellent online courses, that's not its only source of guidance. ODL also uses resources from the Quality Online Learning and Teaching program from the California State University system and the Open SUNY Course Quality Review Rubric and Process.